Ever since I read the Across The Universe series I have wanted to read more books set in space but there just aren't many out there! At least not the type I'm looking for I'm not overly in to sci-fi so finding the right combination can be difficult. 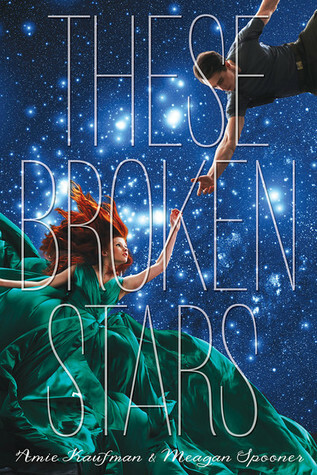 These Broken Stars seems like the perfect new series to fill the star shaped void in my life. Love this cover! I have this on my tbr as part of the 2013 Debut Author Challenge. Here's mine for It Happened at the Fair and The Chaos of Stars. I haven't read too many books set in space but this one is definitely on my tbr list. Awesome pick, it sounds fantastic! Never heard about it, but it seems awesome! I can't wait for this one, too :) Great pick! This book sounds really good and I just love that cover, great pick! I don't read as much SF as I used to, but this looks interesting, and that is a fantastic cover. I'll have to keep it in mind. I haven't read Across the Universe, but I want to! And this one is already on my tbr list. I can't wait. That cover is gorgeous too. I agree! I want to read more space travel type books. December is so far away! This sounds very interesting and I love the cover. This book sounds really good. Can't believe it isn't out until December. Added to my Goodreads TBR! Thanks for stopping by my WOW. Great pick. I can't wait to read this one. Such a great pick Emily! I love the cover so much and Across the Universe was so good! Awesome pick. This sounds great. This is on my TBR list already! I can't wait for this one it sounds SO DARN GOOD! Happy reading!